Old Old Best Week Ever Blog- go to bestweekever.tv: Who's Having The Best Week Ever? Well, it happened: Suri Cruise has finally arrived. 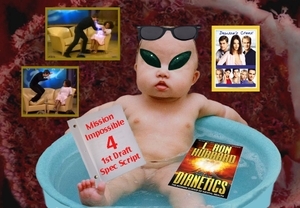 She escaped her mother's womb and is now free to run amock and spread the word of Scientology from coast to coast. Is she having the best (first) week ever? There's only one way to find out. Tune in to VH1 tonight at 11 and all weekend long. I'd do it if I were you. Because if not... Suri'll GET YA! You've been warned.